This year’s Mountain Bike Challenge is an 18 or 26 mile route of testing terrain around some of Calderdale’s best tracks and bridleways. 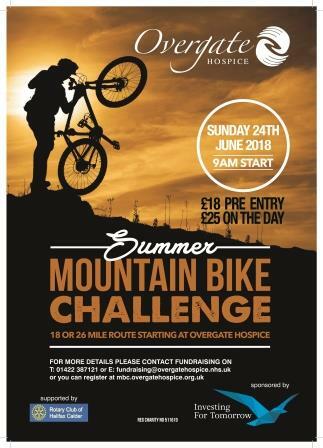 Registration for the 2018 event, which is taking place on Sunday 24 June and starting at Overgate Hospice, is open now. Click here to register online, or call the Overgate team on 01422 387121.